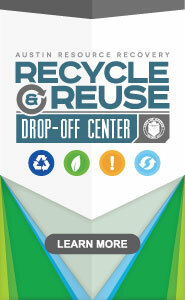 Find help at the Shop Zero Waste directory. This is a list of locally-owned businesses that offer repair or rental services or sell recycled, upcycled or reused products. Use the Repair Education resources at the bottom of this page to learn how to Do It Yourself (DIY). Americans throw away an estimated 1 million tons of plastic plates and cups every year! Most of these discarded items are made from polystyrene foam, which remains in landfills for hundreds of years. You can help reduce those numbers by bringing your own reusable mug or bottle the next time you visit a coffee shop or need to refill with water or other beverages. If you have extra food in your pantry or after an event, get in touch with a local group like Keep Austin Fed or the Capital Area Food Bank. They can help rescue food and redistribute it to those in need. Buy items that can be used more than once such as cloth napkins, food storage containers, razors with replaceable blades and rechargeable batteries. The sharing economy puts idle resources to work. For help finding local rental or other sharing economy services, make sure to look for local Shop Zero Waste [re]Share businesses on Locallyaustin.org. 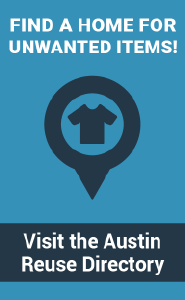 Find out where to donate and resell unwanted or reusable items using the Austin Reuse Directory instead of recycling or throwing them in the landfill.